More and more of my clients are spending a week or more on the island to explore and house hunt. It is what we did way back in 2004 when Bainbridge popped onto our radar as a place we might want to live. We stayed in this cool beach house that is still a rental today. 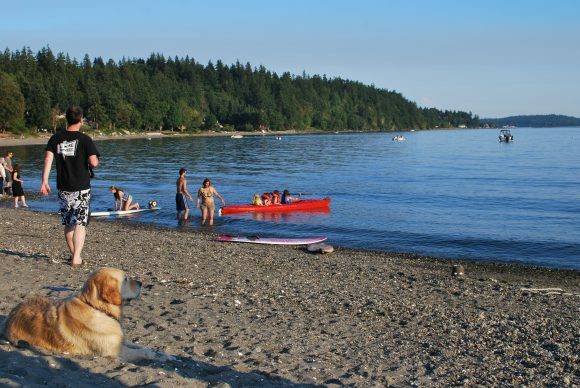 If you plan to visit the island and soak it all in and see the real-life-non-tourist Bainbridge, I recommend you visit the following spots on the island. Visit the South End/Lynwood Center/Pleasant Beach Village – Many tourists start and stop in Winslow, but great things can by found in Lynwood Center. The Treehouse Cafe is an excellent, casual place to eat. Lynwood Theatre is a terrific old-style theatre. Also at Lynwood Center and Pleasant Beach Village there is shopping, coffee, a deli, a B&B, a wine bar, restaurants, a bakery, a farm store, frozen yogurt, and a community (membership based) outdoor pool. It is the gem of the south end – the south end hub not to miss. When in the vicinity also visit Lytle Beach, a road-end public beach that has a sandy beach and terrific south-west exposure. Also stop at Fort Ward Park, which has miles of easy walking trails with water views, picnic areas and a boat launch. Both spots are great for soaking in the sun on the south end. For eating at Lynwood Center, besides The Treehouse Cafe, we also really love Sawan Thai Kitchen and the Beach House Bar & Grill. For a more formal dinner the Manor House is excellent. Rolling Bay – Take a quick walk around Rolling Bay. This is the north end hub. In comparison to Lynwood Center it is very small, but it is a community gathering spot, nonetheless. There is an old fashioned post office, cafe, and the best Italian Market on the island, Via Rosa 11. Stop by Via Rosa for lunch or dinner and enjoy their wood fired pizza oven. Bay Hay and Feed is an icon of the island. They has a terrific gift shop, garden nursery, and feed store. When you are up north, visit Fay Bainbridge Park, our waterfront park on the north end with views towards Seattle. At Fay there is a play ground and tons of drift wood. For future reference, Fay Bainbridge even has a campground a great shelters to reserve for parties. Battle Point Park – There is so much to see here. I love the the 1.5 mile loop around the park, but in earlier years when my kids were little I loved the awesome wooden play park. We have spent hours and hours at softball games and soccer games at this park. Their turf fields for soccer are newer and excellent. There is also a mini-gymnasium, planetarium, mountain bike track, ponds, and tennis. And the best part – it is cleared and sunny! Winslow – So, Winslow is pretty terrific. I would recommend hitting Blackbird Bakery, I love their toast and jam and a pot of tea. Mora Iced Creamery also fabulous, you really can’t go wrong on flavors, but I love their brownies and cheesecake. If you find yourself withoug kids I love The Harbour Public House – AKA The Pub. It is on Eagle Harbor with stunning views of Seattle. They have terrific burgers, fish and chips and beer, but I love their fish tacos with a glass of rose. Again, if kid-less, we like Island Vintners and Eleven Winery for wine tasting or a glass of wine – or two. Some of my favorite stores in Winslow are Eagle Harbor Books, Calico Cat Toy Shoppe, Bon Bon Candies, Churchmouse Yarns & Tea, and Wilderness Outdoor Store . . . and there are many fun ones in between. Closer to the ferry in Winslow – Bainbridge Island Museum of Art is an excellent space to walk through. The exhibits change regularly and the BIMA Bistro has the best food. A terrific spot for lunch – one of my favorites. If you have kids in tow, make sure to visit the Kid’s Discovery Museum, right behind BIMA. People visiting for an extended time usually want to check out grocery stores and shopping. Be sure to visit Town & County Market. Not only is this the spot of shopping, especially specialty food items, and seafood, but the salad bar and hot bar are the place to be at lunch time on Bainbridge. Sometimes I go there three times a day. Behind the Town & Country Market is the Waterfront Park and Dock. At the park is a great kid’s playground and the beginning of the Waterfront Trail, which winds its way down to Eakin/Gowan. My very favorite breakfast on the island is at Streamliner Diner. It is adjacent to Town & Country Market. They serve dinner, too, but I love their breakfast, especially their biscuits and jam and crispy hash browns. The Grand Forest – If you are a walker/runner, you will want to explore the Grand Forest. The trails are extensive, groomed and fun. There are several parking spots.Exploring the Grand Forest is a great way to spend a morning or afternoon. Nearby is Bainbridge Gardens. A field trip in and of itself, this is our biggest nursery and a great place to have lunch at The New Rose Cafe. There is also a fun gift shop. If you happen to be here on a Tuesday, please go to Hey Day Farm to have Dinner. You can eat on a real, working farm and have some of the most fantastic food on the island. They do not take reservations, so you need to arrive at 4:30 to try and get a 5:00 seating, but I think it is worth it, especially in the summer. Be prepared for a three hour, multi-course experience, so probably better without kids, but my favorite dinner on the island, hands down. The Bainbridge Public Library – excellent Children’s Library and story time. The Aquatic Center – two pools, a spa, water slide and lazy river. Swimming lesson, swim team, master’s program, and water polo teams. Stop by and take a look. BARN – Bainbridge Artisan Resource Network – new facilities for all kinds of crafting – woodworking, glass blowing, fiber arts, kitchen arts, writing, metal shop. As of this writing they give tours on Sundays.